Dave and I were asked by Hometalk to pull together some awesome DIY landscaping ideas and share them with you. That was easy to do on Hometalk as there are a plethora of wonderful ideas there. So we found 20+ ideas for you from some very creative people. The landscaping ideas we chose are achievable for just about any DIYer and they are also easy on your budget. 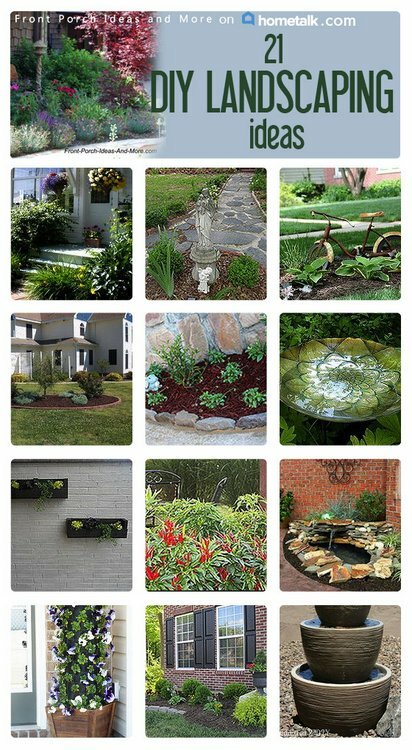 We are delighted to share the DIY landscape ideas that we gathered for you to see. We chose several of our favorites to highlight here for you. Can you just imagine the peaceful sounds from this water fountain and how much ambiance it would add to your garden? 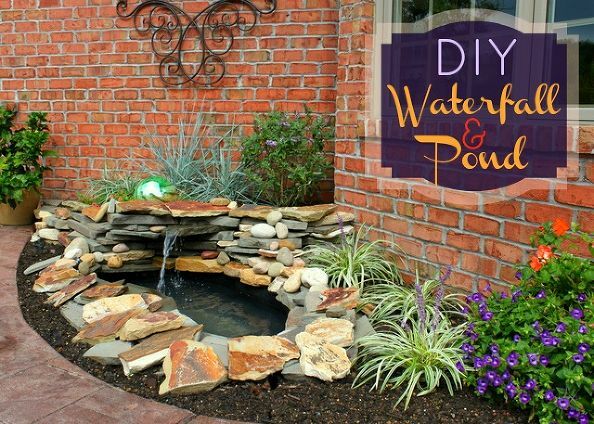 This gorgeous DIY backyard pond from Oh My! 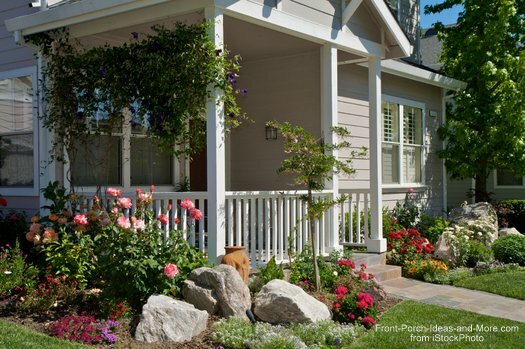 Creative on Hometalk looks like a wonderful project that will pull in some big "wows" from your friends and neighbors. With a few skills, some labor and materials, you could save a bundle by doing it yourself! 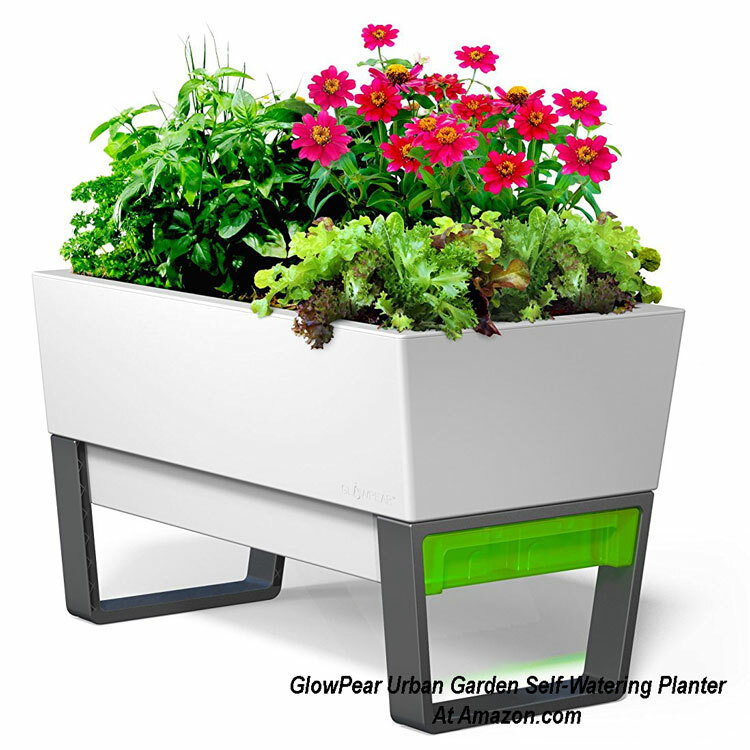 Infuse your personality into your landscaping! Incorporate your style and personality into your landscaping just like you do the interior of your home. Our friends, Doug and Liz, from Hoosier Homemade are down-to-earth and easy going people. 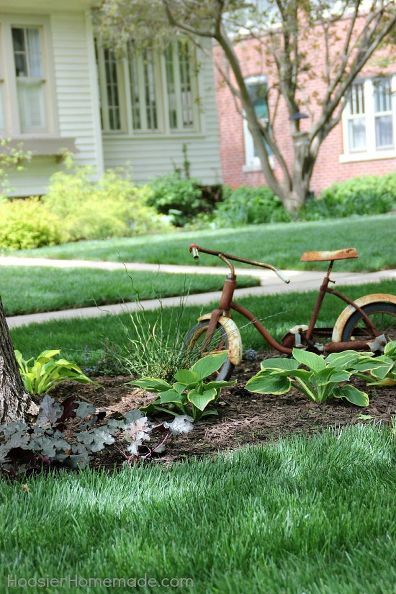 This sweet bicycle sitting in their shade garden reflects their fun and sweet personalities. #3: Build a Pea Gravel Walkway - Easy! Do you have a walkway that needs some attention? This easy pea gravel walkway is an attractive addition to this small charming yard. And the homeowner, Jennifer of Celebrating Everyday Life, took out the old walkway (which was pavers in stepping-stone fashion) and put in this new walkway in one afternoon. Wow! That's what we call productivity. She smoothed (leveled) the area before starting, then put down edging and landscape fabric. Then the pea gravel went in. Like this idea? We have more walkway ideas for you to peruse. 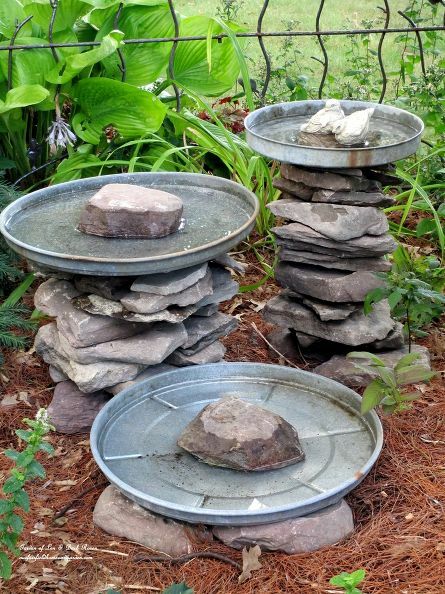 Ever consider making your own birdbath? Ever think about making your own birdbath? This is a really clever idea! You just need a garbage can lid (these are galvanized) and some stacking stones. Then just add water. I love the idea of a grouping of bird baths. This crafty idea is from Barb of Our Fairfield Home and Garden. Like this idea? You might also like the bird feeding station we built at our house. By adding a few rocks to your landscaping like Anna did - in a pleasing arrangement - you add lots of visual interest to your garden area. 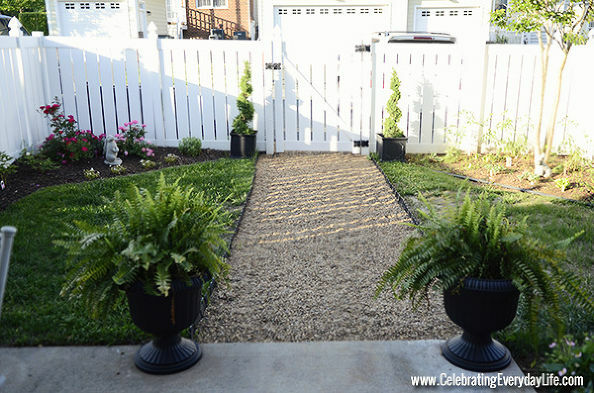 Don't Miss the Stone Edging, Pallet Planters and Stone Walkway - and More! Now, want to see all 21 DIY landscaping ideas we gathered?